V$INDEX_USAGE_INFO: V$INDEX_USAGE_INFO keeps track of index usage since the last flush. A flush occurs every 15 minutes. After each flush, ACTIVE_ELEM_COUNT is reset to 0 and LAST_FLUSH_TIME is updated to the current time. DBA_INDEX_USAGE: DBA_INDEX_USAGE displays cumulative statistics for each index. With these two new views, Oracle automatically tracks the usage of indexes. There are several columns in the dba_index_usage that can be used to find out how many accesses the indexes have received, how many rows have returned, and, even better, there are buckets to create histograms for accesses and rows returned. The most recent time that the index was used is also recorded. In the following example, I will create a table with three columns, with one index in every column. Then I will run some queries against the table in order to use the indexes, and we will confirm that indeed Oracle 12.2 tracks the usage. While the INSERTs sentences also impact the index (index entries must be created in the b-tree), this doesn’t count as “access”. I will execute some queries. I have enabled autotrace to confirm that the query is using the index. This counts as an “access”. 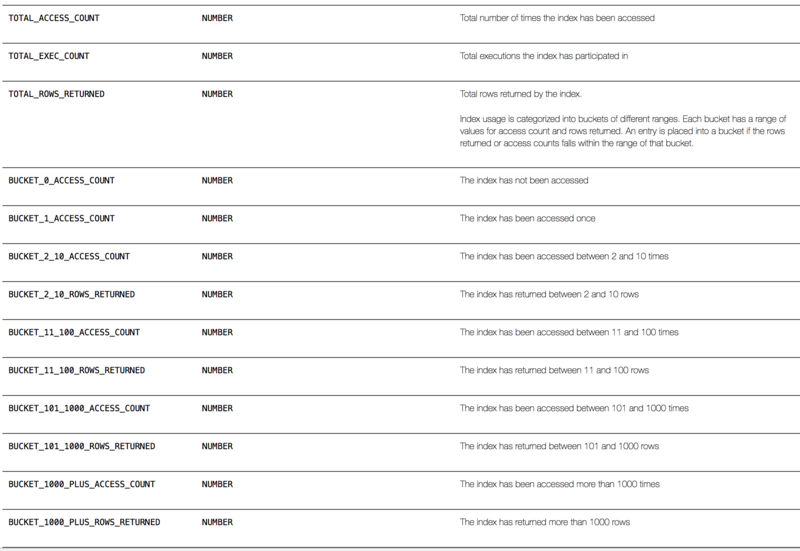 Also pay attention to how many rows each query has returned, since this count is also monitored by Oracle. At the end, we will list how many accesses and how many rows each index has returned and we will confirm whether the data displayed is correct. Fortunately the information about every query I executed was captured, but it seems not all the SELECTs are captured, as Frank Pachot explains in this article. I also saw that if the Quries are executed by SYS the index usage is not captured. The definition of the column “BUCKET_11_100_ACCESS_COUNT” is “The index has been accessed between 11 and 100 times. At first look it seems that this definition is not correct, because I just executed the same query two times for each index. I didn’t execute a query that accessed the index between 11 and 100 times. So apparently this column actually captures its accesses, not operations. Since the first SELECT operations accessed the index 10 times because it returned 10 rows, the bucket_2_10_access_count was increased by one. It is the same for the second query, which accessed the index 11 times because it returned 11 rows; the bucket_11_100_access_count was increased by one. Either there were two accesses of every index because I executed two SELECT operations that touched the index, in which case TOTAL_ACCESS_COUNT is correct but BUCKET_11_100_ACCESS_COUNT is not correct, because I didn’t execute any query more than 10 times and fewer than 101 times. Or, the BUCKET_11_100_ACCESS_COUNT is correct and it doesn’t count the operations (SELECTs in this case) and instead counts every access to the b-tree nodes into the index; in which case the definition of TOTAL_ACCESS_COUNT is wrong. In the following output we can confirm that every bucket received the correct information. For example, for the bucket bucket_2_10_rows_returned there is 1 execution; this is because the first query always returned 10 rows in every index. The bucket bucket_11_100_rows_returned always has the right value (1 execution) since the second query we executed against every index always returned 11 rows. Oracle has been introducing new views that provides very useful information to DBAs so that the DBAs can administrate properly the databases and diagnose problems in order to avoid any reactive problems. For several years scripts, third-parties tools, ALTER INDEX clauses, etc., were used to track the index usage, but this changed now Oracle perform this automatically without overheads in the performance.